CHICAGO, Feb. 8, 2012 - Kia's innovative and hugely successful urban crossover, the Soul, was originally created in the California Studio, the birthplace of the Soul'ster convertible concept that is currently under final assessment for production. Soul has been a hit with consumers since launch, with 48,271 delivered to owners in Europe so far and more than 102,000 sold in the US last year. California studio Chief Designer Tom Kearns and his team have designed the Track'ster concept car in keeping with the Soul's rebellious, individual and urban character. What happens when a dream becomes reality? 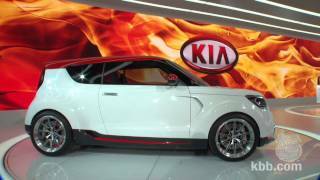 In the case of the Kia Track'ster concept unveiled at today's Chicago Auto Show, car enthusiasts begin to salivate. 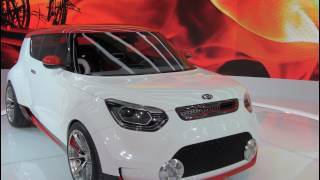 Amid the driving rhythm of heavy-metal music, smoke and blinding lights, Kia Motors America (KMA) took the wraps off a performance-oriented three-door Soul coupe concept that hints at what could possibly be the future of Kia's wildly successful Soul. "The idea was to make the Track'ster tough looking, like a bulldog," said Tom Kearns, chief designer for KMA. "But the car had to be approachable as well. We wanted to base the car in reality so people instantly knew it was a Soul, but with a lot of attitude. 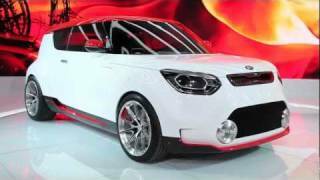 It had to be a bold interpretation that would change people's conceptions of what a sporty Kia could be." The bold attitude Kearns refers to starts with the eye-catching Whiteout and Inferno Orange paint scheme. While the white portrays complex layers and shades that contribute to dramatic depth, the orange is perfectly suited for racing. Kia's signature grille features an air intake slit and is trimmed in lightweight carbon fiber. Smoothly integrated head lights sweep back suggestively over the sculpted front-wheel arches. The deeply recessed lenses echo the trapezoid themes found throughout the Track'ster and are accented with compelling LEDs. Most striking up front is the Track'ster's lower intake grille. Flanked by immense LED driving lights with billet aluminum surrounds, the Track'ster is capable of swallowing prodigious amounts of air to keep the engine running cool even under the most grueling conditions. The lower valance, trimmed in carbon fiber and accented with Inferno Orange, rides just inches off the ground and lends to the car's menacing stance. The Track'ster is not just another pretty face; it has a body to match. Sculpted surfaces seem to flow into each other naturally. The flanks are smooth but accented with well-defined wheel enclosures. Tucked beneath the Track'ster's hips are custom HRE-K1 monoblock billet performance wheels that were a joint effort of Kia's California design team and HRE. The wheels are wrapped in 245/40-19-inch front and massive 285/35-19-inch rear Michelin Pilot Sport PS2 high-performance tires. The wheelbase on the concept is stretched to 101.2 inches, almost an inch longer than the production Soul. As expected on a car with the Track'ster's performance intentions, large 14-inch Brembo vented and cross-drilled disc brakes are embraced by six-piston calipers in front and 13.6-inch discs are paired with four-piston calipers at the rear. Soul fans will instantly recognize the Track'ster's angled roof, accented with Inferno Orange. 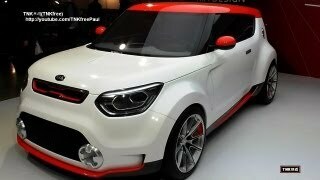 Closer inspection reveals this concept, while Soul inspired, is missing the production car's rear doors. The front doors have been lengthened and adorned with smooth billet push-style handles which echo the racing-inspired billet fuel filler door. Carbon fiber lower side valances are also accented in Inferno Orange and incorporate functional rear-brake cooling ducts. The back hatch incorporates a horizontal Inferno Orange "backpack" panel that accentuates the Track'ster's 75.5-inch width, which is more than 5-inches wider than a production Soul. With performance as the top priority, the Track'ster rolls into Chicago with a concept drivetrain sure to kick start any driving enthusiast's heart. KMA's design team dreamed big, but also kept their vision firmly rooted in reality. A 2.0-liter turbocharged inline-4 engine pumps 250 horsepower to the pavement, a 66 percent increase over that of the production Soul. Power is routed to all four wheels via an electronically controlled four-wheel-drive system. The short-throw six-speed manual transmission is capped with a stubby spherical shift lever. The Track'ster rides on a lowered sport suspension tuned for track performance. Opening the driver's door reveals a light and airy interior highlighted with deeply bolstered Inferno Orange suede-covered racing seats. Granite Gray leather envelopes the interior landscape and imparts a feeling of strength and stability. Granite Gray suede wraps the sport steering wheel and door panels. Located deep within red-glowing nacelles, the primary instruments are large and easily readable. Auxiliary vehicle information such as oil temperature and battery voltage is found atop the dash panel while navigation, entertainment and HVAC controls are accessed through a large touch-screen panel located just above the engine Start/Stop push-button. Behind the front seats is where Track'ster takes a significant step away from its Soul stable mate. The rear seats have been removed and replaced with a fully integrated equipment tray and spare-tire well. "We saw the Track'ster as a performance-inspired concept that could spend time on the road and racetrack," said Kearns. "The idea was to make the tools and equipment necessary to keep the car performing in top condition easily accessible." Large paneled bins stow racing gear such as helmets, suits, gloves and tools while emergency supplies are housed within a separate and highly visible Inferno Orange container. A custom rear strut brace incorporates a quick-release handle to allow for fast wheel changes. 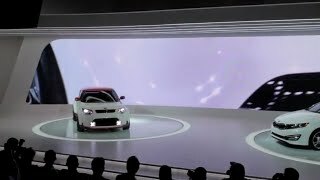 While there are no current plans to produce the Track'ster, Kia's California design center team enthusiastically took on the project. "Concept cars are icing on the cake," said Kearns. "They allow KMA's design team to dream about what could be. Whether that dream becomes a reality or not is a separate question." Kia Motors is the one of the world's fastest moving global automotive brands; from 2009-2011 Kia launched more new vehicles in the U.S. than any other automaker, and under the guidance of chief design officer, Peter Schreyer, earned a reputation as an industry leader in automotive styling. Kia Motors America's full line of fuel-efficient and fun-to-drive cars and CUVs has earned critical acclaim and dramatically increased consumer awareness, perception and consideration for the brand. In 2011, KMA recorded its 17th consecutive year of market share growth, thanks in part to the largest increase of any major brand in perceived quality1 and the industry's highest brand loyalty ranking2. Kia's U.S.-based manufacturing facility in West Point, Georgia – KMMG – is responsible for the creation of more than 10,000 plant and supplier jobs and builds the company's two best-selling vehicles in the U.S. – the Sorento CUV and Optima midsize sedan3. Kia's value and technology-laden 2012 model year lineup also includes the Sportage compact CUV, Soul urban passenger vehicle, Optima Hybrid, Forte compact sedan, Forte 5-door compact hatchback, Forte Koup two-door coupe, all-new Rio and Rio5-door sub-compacts and Sedona minivan.